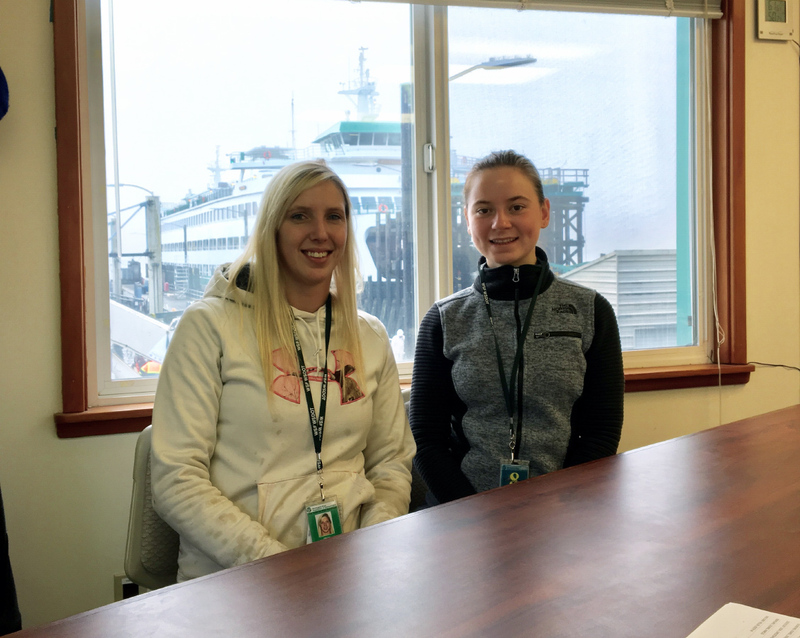 Two new apprentices are learning tricks of the trade at our Washington State Ferries' Eagle Harbor Maintenance Facility. That's where more than 100 employees keep the ferry system functioning by repairing and maintaining our vessels. Celia Brooks and Jules Hadley were recently hired to shadow and work alongside journeymen at the complex, which is home to 10 different trade shops. The goal is that apprentices will be ready to move up to full-time employment when they complete the program. With many of the facility's employees approaching retirement soon, we have been working to secure funding for apprenticeships for several years now. We finally got the OK for two positions in April 2017. Both apprentices know how important their apprenticeships are for the future. "We have to soak up as much as we can from them and we need more people to do it," Celia said. in the Eagle Harbor Maintenance Facility electrical shop. But attracting candidates has been challenging, an issue facing employers across the maritime and industrial landscape. Celia was the only person to apply for her spot in the electric shop. Jules was one of six candidates for her position in the pipefitter shop. There are a variety of factors that make recruitment complex, but one is surprisingly simple. "A lot of (students) don't know about the trades," Jules said. "Having more apprentices would be a great benefit." R.J. Kelly, Eagle Harbor's general manager, said he is looking to go against that trend, eventually recruiting for apprentices to join his other eight shops – machine, sheet metal, weld, lock, radio, carpenter, insulation and shore maintenance. speaks with some of the journeymen who work at the facility. 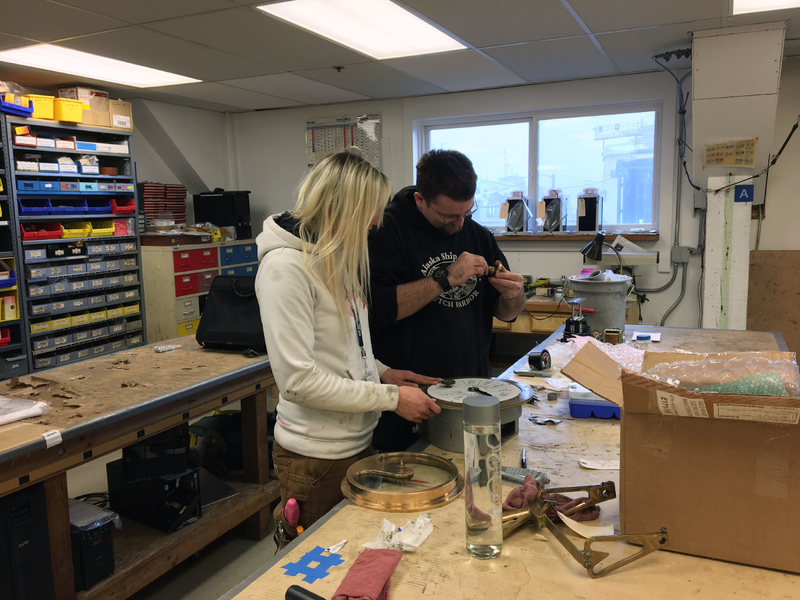 While there are no additional apprentice positions currently available at his facility, R.J. said he encourages anyone looking to get into the maritime trades to contact the Metal Trades Council or Pacific Northwest Regional Council of Carpenters. Both serve as apprenticeship program sponsors. Those interested in shore maintenance can get their start by applying with us as an ordinary seaman or get training from schools like Seattle Central College's Maritime Academy. It's Celia's love of ferries that got her into the marine side of electrical work at Vigor Industrial in Seattle, then at ACI Boats in Port Townsend. She started her career in the Job Corps, working as a residential and commercial electrician. Celia's first day at Eagle Harbor's electric shop was Nov. 16. This shop handles all things electrical on the ferries and at the terminals. She's already worked on things like generators, pumps and vessel steering. Celia said she would one day like to move up to management, possibly doing electrical inspection work. 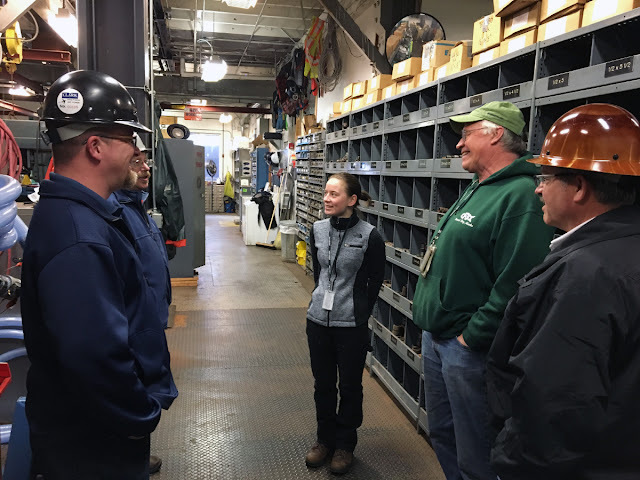 Jules started at the pipefitter shop on Dec. 5, following six months in South Seattle College's Welding Intensive for Maritime & Manufacturing Environments program. She's already worked on vessel inspections, checking that carbon dioxide and sprinkler systems go off properly in case of emergency. As a regular ferry commuter, Jules said knowing the ins and outs of something you take daily is always important to know about. "Hopefully when I'm done with my program I end up an employee here teaching someone else the same thing that they're teaching me now." Maintenance Facility, where they'll learn how to keep our boats operating. Celia and Jules join only a handful of women who work at the facility. R.J. said he wasn't specifically looking for women to fill these apprenticeships, but they are a welcome addition to a workforce that better reflects the population we serve. While R.J. said he recalls having only one woman apprentice in the past, his two apprentices both seem to be fitting in well and co-workers are excellent about answering questions and making sure they get the hands-on experience they need to improve. "A lot of people think the blue-collar guys would be rough and rugged, but these guys are just like a family," Celia said. Celia and Jules both said that more women counterparts would be a refreshing sight. "This isn't a man's world anymore," Celia said "We all are strong-willed and we have hands that work just as well, brains that work just as well." "Don't stop dreaming," Jules added "If it's your goal, go for it. Don't have anyone stop you. If it's something that you love to do, don't just settle for something that someone else thinks you should be doing." With the recent derailment of an Amtrak Cascades train, we wanted to talk a bit about the Point Defiance Bypass and our agency’s work to develop it for Amtrak Cascades passenger train service. Our thoughts remain with the passengers and families involved in the tragic Monday, Dec. 18, derailment and we want to answer questions that have arisen about the tracks where the train derailed. As a transportation agency, we must always balance providing service goals with funding and schedule constraints. Our goal with our recent improvement project was to provide better reliability and six Seattle to Portland roundtrips. The work done on the Point Defiance Bypass – and the rest of the tracks from Blaine to Vancouver, Washington – achieved those goals, allowing us to continue to travel at the same maximum speed as before – 79 mph – but improving the reliability of our service and giving travelers two additional options for daily roundtrip service. The track configuration as it exists today meets all Federal Railroad Administration requirements. The bypass tracks have a reduced speed limit before the curve where the derailment took place to inform engineers to decrease their speed to negotiate the curve. The maximum speed limit decreases from 79 mph to 30, with signs posted two miles before the speed zone and just before the speed zone approaching the curve. Amtrak is responsible for ensuring all engineers on this specific set of tracks are qualified. It is common for railroads to have areas of reduced speeds due to curves or other factors, as found along the entire Cascades route. Trains successfully ran the bypass track numerous times in the past few months during track testing, locomotive testing and engineer qualification on the tracks, and the ceremonial train ride with passengers on Dec. 15 during the new station dedication. The investigation by the National Transportation Safety Board (NTSB) will determine the cause of the derailment and we cannot speculate as to what caused it while the NTSB conducts its important work. We’ll continue to share updates and any information we can while the NTSB investigation continues. This week, we’ve seen the very best of humanity when circumstances couldn’t have been more difficult. On Monday morning, Dec. 18, an Amtrak passenger train derailed in DuPont, blocking all lanes of southbound Interstate 5. As the sound of sirens filled the air, our staff dropped what they were doing and rushed to the scene. While soldiers from Joint Base Lewis-McChord (JBLM), firefighters, medics and other passersby treated and transported the injured, we set up detours and alternative routes with other local agencies to keep people moving. Nearby cities sprang into action, establishing places where family members could be comforted, supplied food and water to family gathering areas, and an area Incident Command Center. Several people were hurt, and lives were lost. Our hearts, thoughts and prayers are with everyone affected by this tragedy. Two of the victims, former co-workers Jim Hamre and Zack Willhoite, were familiar faces to us personally. While work continued at the site of the derailment, it was a challenge for people to go about their daily lives, but it was made possible by communities who came together. Commuters and freight haulers were rerouted onto detours that added up to 75 miles, and at times, hours to their trips. Local cities and counties worked cooperatively to reroute traffic and change signal timing for the extra vehicles making their way through each town. Our partners at JBLM opened a section of Perimeter Road to the public for a local detour route. Our dedicated maintenance crews worked tirelessly in rain, wind and near-freezing conditions to reopen southbound I-5 once they were cleared to begin road repairs. Shortly before 5 p.m. on Wednesday, Dec. 20, two lanes of southbound I-5 reopened to traffic. Four hours later, the final third southbound lane reopened along with the full I-5/Mounts Road interchange. We are grateful for the work of our partners at the Washington State Patrol, Pierce County, JBLM, Amtrak, Sound Transit, the Department of Ecology, and numerous area police and fire departments and medics. We would also would like to thank the cities, residents and businesses along the various detour routes in Mason, Kitsap, Thurston and Pierce counties. 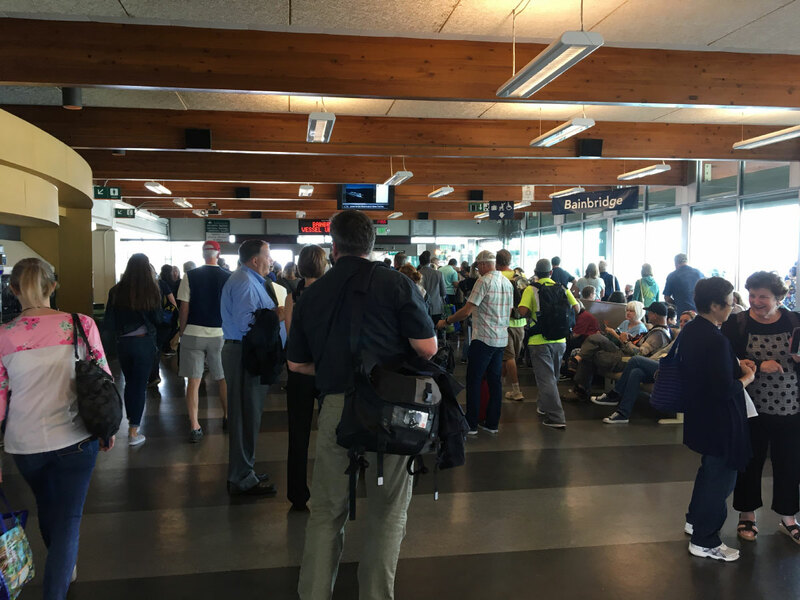 The communities of DuPont, Lakewood, Steilacoom, JBLM, Roy, Yelm, Tenino, McKenna, Port Orchard, Shelton, Belfair and everyone in-between, all worked to help travelers make it to their destinations. While the traffic may be moving again and the wreckage removed, the images and actions that took place these past few days remain on our mind and in our hearts. We thank those affected for their patience, understanding and compassion, as we worked together to restore the region’s transportation system. To the helpers – our sincerest thank you. We opened the SR 520 bicycle and pedestrian trail Wednesday all the way across Lake Washington – the first-ever non-motorized cross-lake connection alongside this highway. This trail extension adds a new route to the regional trail system and links communities on both sides of Lake Washington. Whether you're a serious bike rider, a casual commuter or a weekend explorer, we built the new SR 520 Trail for you! Over the past decade of work, phase by phase, planners, designers, engineers and construction crews built the world's longest floating bridge and its bicycle/pedestrian trail. Each chapter of the SR 520 project has to be phased in an exact order to keep people moving and to maintain crews' access to complete the job. Opening the trail marked the completion of another SR 520 phase. Rain or shine, we hope to see you out on the trail soon. Whenever you decide to adventure out to the new SR 520 Trail, be sure to check out our bicycle and pedestrian counter at the western end of the trail. This counter displays a running total of how many people crossed the western end of the new SR 520 trail. As of Wednesday night, the counter had already reached more than 1,800! Over the past few months, we've heard many community members express excitement about being able to cross Lake Washington without a car or bus. Using the trend #HumansOf520, some told us they will use the SR 520 Trail to connect to families, jobs, classes, exercise routes and more. 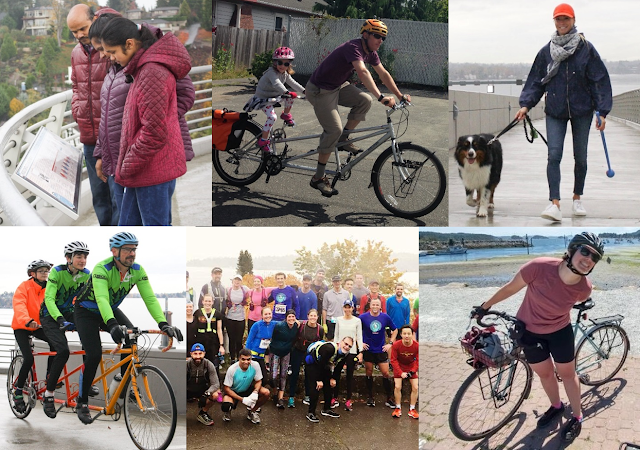 With the trail now open, we want to take a moment to highlight these #HumansOf520 and thank them for sharing their stories. No matter how you plan to use the trail, we can't wait to see you out there! Santoshi, top left: "I'm 12 years old and a middle school student in the Bellevue-Redmond area. The Seattle Central Library is one of my favorite destinations to explore but there is no easy way to get to it using a bike from Bellevue. When the path opens all the way to Seattle on Dec. 20, I'll be able to bike from Bellevue to Seattle (across the world's longest floating bridge) to get any books I want even from the Seattle area! It's been my dream for nearly a year now. Ben, top middle: I am excited about taking my 5-year-old daughter on a bike ride from Seattle to visit her grandparents in Bellevue. She rides on the back of a tandem bicycle with me (she has a special raised-up set of cranks so she can reach). We have been watching the SR 520 bridge construction progress over the years and are excited about the opportunity for a new way to experience our area. Teri, top right: Loki, my 2-year-old Australian shepherd, has had boundless energy since he was a puppy. When I heard the 520 trail would open all the way to Seattle, I knew Loki would want to make the 3-mile trek across the lake - so on December 20, come rain or shine, we plan to cross Lake Washington as a new adventure. Who knows? Maybe he'll be the first dog to cross the lake on 520! Charles, bottom left: Once the path opens I will have shorter commute options, better choices for transit across the lake and I will be able to enjoy evenings in the city without having to worry about waiting for a bus on a late night-schedule to get home across the bridge. I am excitedly looking forward to many new adventures with my family and a healthier, shorter, eco-friendly and more relaxing commute." Vince, bottom middle: "Here's the deal - I run with a fantastic group of people, the Greenlake Running Group. We have more than 4,000 members on Facebook, but about 400 active members who attend one of our 12 weekly runs. We are always looking for new long-run routes, and many of us are looking forward to the 520 - I-90 Loop! The longest floating bridge in the world, and the widest floating bridge in the world! Lauren, bottom right: When I finished my [Certified Public Accountant] classes in fall of 2016, I began searching for employment at public accounting firms throughout Seattle. I received offers from two firms - one in downtown Seattle and one in downtown Bellevue. I absolutely loved the one in Bellevue, but I was nervous about a cross-lake commute. However, this was the beginning of my new career and I knew that the Bellevue firm was the right fit. I also knew that the 520 bike path was under construction, and that one day I would be able to bike commute to Bellevue. So I said "yes!" to the Bellevue firm. Here I am, one year later, and I'm so glad I prioritized my career over a shorter commute. Petra, top left: I am so excited when the 520 bike trail is open! During summer, early fall and late spring I commute to work by bike. I live in Kirkland (near Bridle Trails) and I work at the University of Washington Medical Center. I do enjoy this commute but it is very time consuming. Once the 520 bike trail is open, it will cut my commute miles from 46 miles to 26 miles! Jenny, top middle: My cycling friends and I are excited about creating a loop starting on Mercer Island, heading east to Enatai, heading through Medina up to the 520 Bridge, crossing to the Arboretum, then heading back to Mercer Island for a new exercise loop. Mark, top right: It's the final link between Ballard and Bellevue. I plan on commuting via the bridge on my e-bike – one more car off the road! Lyle, bottom left: I currently commute on the Sound Transit 540 bus from the South Kirkland Park and Ride to and from the University of Washington Medical Center. There are times where I know I will miss the last bus of the day, forcing me to drive on those days. With the opening of the bicycle/pedestrian lane across the 520 bridge, that will no longer be an issue. Robin, bottom middle (at right): My sister lives in Montlake. I live in Bellevue. Now, after 43 years of biking around the lake, and we are both in our 70s, it will be nice to have a shorter bike ride to visit each other. 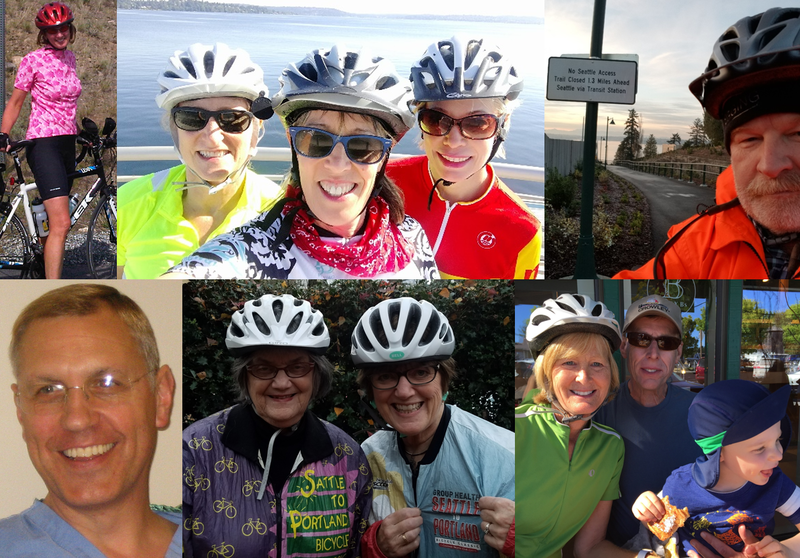 Steve and Kris, bottom right: My wife and I live in Kirkland, and plan to bike over the new 520 bridge trail as soon as it is completed to visit our grandkids in NE Seattle. What a great way to stay fit and visit family! Teddy, not pictured: Right now I take two buses to my work in Kirkland. When the bike bridge is completed, I'm hoping to bike to and from my work, 20 miles round trip, every day, rain or shine. Ambitious goals I know, but this bridge would make it possible! Jeff, not pictured: We live in Kirkland, and my son and I are looking forward to riding our bikes to football games at Husky Stadium. Laurie, not pictured: I can't wait. I will be using the bike trail to ride to Bellevue for fun and shopping. Yay! Alex, not pictured: I am 42 and have been waiting for a bike path across 520 my entire life. Growing up in Redmond, my friends and I would take the bus across the lake into Seattle to ride our skateboards, visit the cool shops, see concerts, whatever. Metro routes 251, 254, and 255 were our lifeline, our connection to a real city. A path we could've biked/skated/walked across would've been so great, and I hope today's kids use it for adventures. The day the new path opens, I'm going to ride a bike to that Cross Kirkland path and meet my old friend for a beer. I'm gonna take my time, and ride back to my home in Seattle whenever I want. I may cry a little. This is big. Very big. It will surely become one of the All-Time Bike Paths within a week of its opening. I'm excited. Thanks for finally getting it done! Thank you to all of our #HumansOf520 for sharing your stories with us and the community! UPDATE - Dec. 22 1 p.m.
WSDOT announced Thursday, Dec. 21, that Amtrak Cascades passenger rail service will not return to the Point Defiance Bypass route until positive train control (PTC) technology is activated on the bypass. This is not because we have any reason to believe the tracks are unsafe – the tracks were thoroughly inspected and tested and we believe them to be sound. We made this decision to be sensitive both to the people involved in Monday’s tragic derailment and our ongoing passengers. We also want time to reach out to communities along the bypass before service resumes. Our trains will use the original route for the time being. The original route does not yet have PTC activated for Amtrak passenger trains, but we’ve had millions of successful boardings on it during the past two decades. BNSF has details about PTC activation for freight trains on the original route. 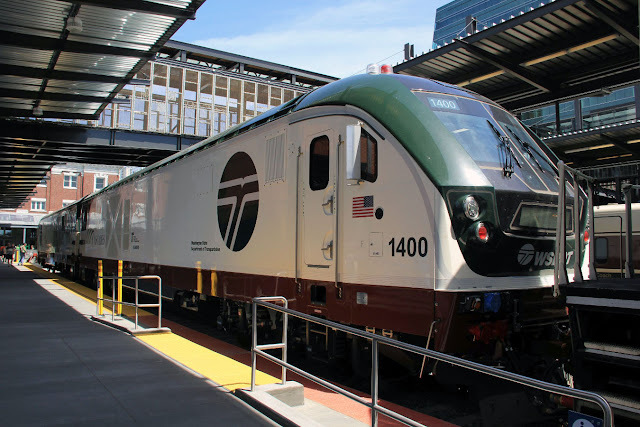 *Traveler note: With Amtrak Cascades trains staying on the original service route, travelers in Tacoma will use the 1001 Puyallup Ave. station rather than the Tacoma Dome Station on East 25th Street at Freighthouse Square. UPDATE - Dec. 20 9:47 p.m.
As of 9:47 p.m. Wednesday, Dec. 20, all lanes of southbound I-5 at Mounts Road (milepost 116) have reopened to traffic. Crews were able to complete remaining work activities in the right lane and reopen that third and final lane ahead of schedule. The Mounts Road on-ramp to southbound I-5 has also reopened. There are no remaining closures following the Monday, Dec. 18, train derailment. UPDATE - Dec. 20 5 p.m.
DUPONT – Traffic is moving once again on outhbound Interstate 5 south of the city of DuPont following a train derailment that blocked all lanes earlier this week. At 4:50 p.m., Wednesday, Dec. 20, the Washington State Department of Transportation reopened the two left lanes near the Mounts Road exit. "It took a highly-coordinated effort with several agencies during the initial emergency and recovery to reopen the highway after this terrible tragedy," said WSDOT Regional Administrator John Wynands. "We appreciate the patience of people in the nearby communities and users of the road while crews worked to ensure this stretch of I-5 is safe for the traveling public." Before heading out the door, travelers can find updated information on the WSDOT website, WSDOT mobile app and by following @wsdot_tacoma on Twitter. UPDATE - Dec. 20 3 p.m.
WSDOT UPDATE: TWO LANES OF SOUTHBOUND I-5 IN DUPONT SLATED TO OPEN BY 5 P.M.
Two lanes of southbound I-5 at Mounts Road (milepost 116) and the Mounts Road off-ramp in DuPont are slated to open by 5 p.m., Wednesday, Dec. 20. The right lane of the highway will remain closed overnight while crews finish additional emergency repairs. Our goal is to reopen the third lane of the highway and the Mounts Road on-ramp in time for the Thursday morning commute. For the safety of crews and travelers, we ask drivers to keep their speed below 45 mph. We expect heavy congestion through the area, especially with increased holiday travel. Remember to be cautious, patient and attentive while driving. MORE INFORMATION: For the latest travel information check the WSDOT blog or follow @WSDOT_Tacoma on Twitter. UPDATE - Dec. 20 11:40 a.m.
All of the train cars are now removed from the area, but there is still a lot of work to do. First we will clear the trees in the area that have been identified as in danger of falling over. Our crews can then safely enter the area to assess the extent of the damage to the roadway and guardrail. What exactly needs to be repaired in order to allow traffic to safely move through the area will be determined. Then we will work to reopen Southbound I-5 as soon as safely possible. People on bikes will encounter heavy traffic on detour routes used by drivers due to the I-5 closure. Travelers using all modes, please use extra caution. UPDATE - Dec. 20 8:50 a.m.
From 9 - 9:30 a.m. the locomotive move will require temporary closure of SB I-5 closure at Steilacoom-DuPont Rd at exit 119. Locomotive will move northbound in southbound lanes. No impact to Northbound freeway traffic. Load weighs 270,000 pounds and is 270 feet long and can only move several miles per hour. After the load is off I-5, the closure point will return to Center Drive and reopen as a local only detour. Steilacoom-DuPont Road will be closed as load is taken to investigation area. We still have no ETA on when southbound lanes will reopen to traffic. UPDATE – Dec. 20 6:45 a.m.
All the locomotive cars have been removed from I-5 after work overnight, but the heavy 270,000-pound locomotive still must be moved from the roadway using special equipment due to its size. The locomotive has been placed on a special trailer but we do not yet have an eta for when the locomotive will be moved today or when the roadway will reopen. The primary detour is SR 16 to SR 3 – which is what commercial vehicles should use. We are seeing significant congestion on SR 507 and SR 7, and do not recommend travelers take SR 302. A local-traffic-only detour is set up on Center Drive through JBLM to Nisqually and connecting to I-5. Drivers can expect heavy traffic on any alternate route and we are encouraging folks to only travel through the area if needed. UPDATE - Dec. 19 9 p.m.
Operations to remove the remaining rail cars on and adjacent to the southbound lanes of Interstate 5 will continue through the night. Crews made substantial progress today in clearing the site. Most of the derailed train cars have been loaded onto semis to be hauled away and securely stored. Bridge engineers also inspected the rail bridge and deemed it structurally sound, with only minor repairs needed for safely reopening the interstate. Remaining work includes relocating the cranes to position them to remove the train's locomotive, which remains on the southbound I-5 lanes. Crews also need to remove a hazard tree. It is highly likely southbound I-5 will remain closed through Wednesday morning's commute and travelers should plan accordingly. 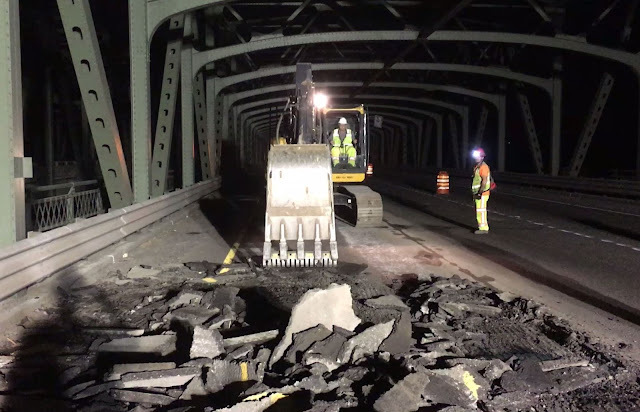 WSDOT maintenance crews have pre-staged supplies, equipment and staff, and plan to begin repairs on guardrail and damaged portions of the highway as soon as they are cleared to do so. UPDATE - Dec. 19 5:20 p.m.
A lot of progress was made today in challenging weather conditions. Crews removed six rail cars and mobilized specialized equipment to remove four more rail cars and locomotive. Once the rail cars are removed, crews will begin repairing damaged guardrail and pavement. WSDOT and Sound Transit engineers will assess the rail bridge structure prior to reopening of the highway. It is still too soon to tell when the highway will reopen. UPDATE - Dec. 19 Noon. Southbound I-5 is not expected to open before tomorrow morning's commute. We're seeing upwards of 14 miles of backup on the 507 detour and recommend travelers take the SR 16/SR 3 detour. Five of the 14 rail cars have been moved and crews are working to move the large locomotive this afternoon. UPDATE - Dec. 19 10 a.m.
Crews are beginning work to remove rail cars and the locomotive from the derailment scene on southbound I-5. This includes removing five rail cars on trailers as well as the locomotive sometime this afternoon. We are working with JBLM to find a staging area to place the rail cars and also working with the city of DuPont on the best route to take. At this point, we do not have a reopening time for I-5 southbound though we are working to reopen it as soon as we can safely do so. Please continue to avoid the area to allow emergency crews room to do this important work. UPDATE - Dec. 19 8:09 a.m.
A local-traffic-only detour is set up on Center Drive through JBLM to Nisqually and connecting on to I-5. UPDATE - Dec. 19 5:15 a.m.
Southbound I-5 in the DuPont area will remain closed at least through the Tuesday AM commute. Expect lengthy delays on all alternate routes & avoid the area if possible. Follow @wsdot_tacoma for latest traffic conditions. UPDATE - Dec. 18 8:50 p.m.
WSDOT will start tweeting live conditions at 4:30 a.m. Tuesday, Dec. 19 on Twitter channel @wsdot_tacoma. Crews continue to work through the night on the train derailment, including investigating and planning for roadway clearing, which will begin once the National Transportation Safety Board (NTSB) authorizes removing the train cars. Our thoughts remain with the passengers and families affected by this crash and for the emergency responders from multiple agencies who are working tirelessly at the scene. WSDOT will reopen traffic on Southbound I-5 as soon as it is safe do to so. All entities involved are working as quickly as they can, but we are anticipating this work may take days, not hours. Northbound I-5 is open to traffic though backups still exists as motorists slow to observe the scene. We continue to ask travelers to avoid the I-5 southbound area or alter travel plans if possible. Southbound, the through-traffic routes are SR 16/SR3 and SR7/SR 507/SR 510. Local traffic only can use a detour established at Center Drive through JBLM to State Route 510. JBLM is handling traffic control on base and the Washington State Patrol is handling traffic control outside of the base. Drivers can expect heavy traffic on any alternate routes and we are encouraging folks to only travel if needed. The Mounts Road Gate onto JBLM will be closed in the morning. Some limited service resumed Monday and will continue Tuesday using the former route around Point Defiance. Passengers with travel plans also can confirm their train's status, change their plans or review refund information using a range of tools – including Amtrak.com, smartphone apps or by calling 800-USA-RAIL. Service Alerts, Passenger Notices and other announcements are posted at Amtrak.com/alerts. Speed around the curve is 30 mph. Maximum authorized speed prior to that speed zone allows trains to travel up 79 mph; however, there are a number of areas where the speeds are limited below that maximum. Speed signs are posted two miles before the speed zone and just before the speed zone approaching the curve. Engineers are trained to slow trains according to posted speeds. While equipment has been physically installed in the Lakewood subdivision where the incident occurred the system is not yet operational or certified for use. Full implementation is planned to occur by the second quarter of 2018 on that segment, in advance of the deadline. Sound Transit, Amtrak and other agencies are working to implement positive train control in the Puget Sound region in advance of a December 2018 federal deadline. Work will continue in the coming months. Monday's derailment of an Amtrak Cascades train in DuPont creates a significant traffic impact that could last for several days. Southbound I-5 is closed with traffic being detoured off at Center Drive north of Mounts Road. There is no estimate as to when the highway will reopen but it will likely remain closed at least through Tuesday morning, but a definitive time hasn't been determined. While we encourage people to avoid the area if possible, the primary alternate route after exiting at Center Drive will be going through Joint Base Lewis McChord to State Route 510. Drivers will be directed through the Center Drive Gate, Perimeter Road, Mounts Road Gate, Old Pacific Highway and SR 510 back to I-5. There will be traffic control handled by JBLM on the base and the State Patrol will lead traffic control in other areas. Because Center Drive is a two-lane, local road, it does not easily accommodate freight traffic. Freight traffic is advised to use SR 16 to SR 3, then US 101 to get back to I-5 near Tumwater. There has been significant congestion on many nearby highways including SR 7, SR 507 and SR 302. Please note that regardless of which alternate route you might take, very heavy congestion should be expected. The detours do not have the same capacity as I-5 and are not equipped to handle the same level of traffic. Drivers going northbound should stay on I-5 and avoid exiting at Center Drive to leave that road clear for the southbound detour. Please be sure to give any emergency response crews plenty of room to reach their destination. For updates on information, people are encouraged to sign up for our email/text alerts at https://public.govdelivery.com/accounts/WADOT/subscriber/new?topic_id=WADOT_534. Maximum authorized speed prior to that speed zone allows trains to travel up to 79 mph; however, there are a number of areas where the speeds are limited below that maximum. On December 20, 2017, WSDOT will celebrate a major milestone NOT involving cars or other motorized transportation. That day will be the first time bicyclists and pedestrians from the Eastside and Seattle’s neighborhoods will be able to connect using the new SR 520 trail. Crossing the lake on the north side of the bridge, people walking and rolling will have unprecedented views as they trek from the Eastside to Seattle or vice versa. Our traffic engineers estimate that about 1,000 riders and pedestrians will use the path on a daily basis. The Eastside half of the floating bridge path has been opened for more than a year but has only been an “out and back” experience on the floating bridge. Now that the project that connects westbound lanes from the floating bridge to Montlake is built, WSDOT is ready to unveil the new cross-lake path. Before opening it, one of the final steps will be a fresh sweep of the path to get it in shape by cleaning the leaves and other debris that collected on the path since the first half opened last year. Large enough to clean the highway yet small enough to clean the SR 520 Trail, Broom Hilda is part of WSDOT’s important maintenance fleet. 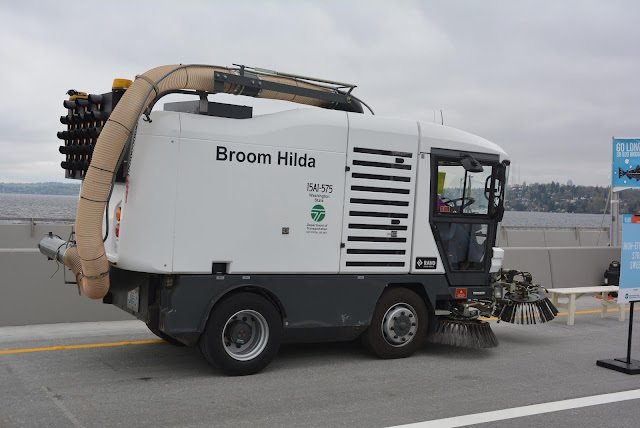 Enter Broom Hilda: the SR 520 sweeper. About two years ago, @WSDOT_520 Twitter followers named the sweeper just before we opened the floating bridge. Large enough to sweep travel lanes on SR 520 and small enough to sweep the adjacent bike and pedestrian trail, the cute but capable sweeper has found a place in WSDOT’s maintenance fleet. Since we opened the floating bridge, Broom Hilda had been relegated to cleaning SR 520 lanes and the path east of the floating bridge. 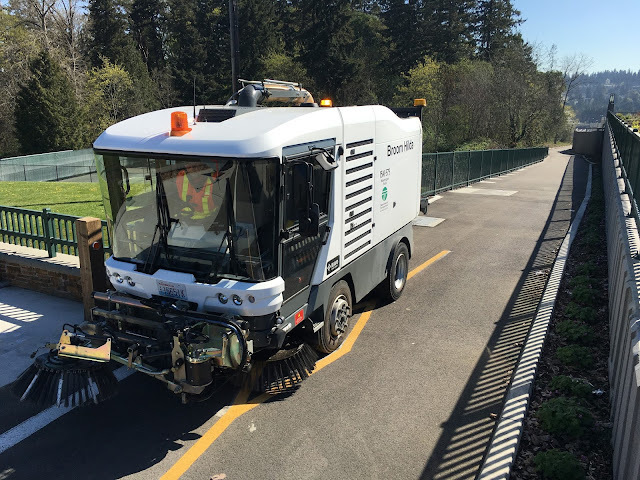 Once the trail opens, the sweeper will literally clear the path for non-motorized users to cross nearly three miles over Lake Washington between the Eastside and the Montlake neighborhood. Broom Hilda’s initial run across the trail this week will be tough – this time of the year nature throws a lot of debris our way. Broom Hilda will continue to be a workhorse for the SR 520 corridor. The sweeper is scheduled to clean the SR 520 lanes once a month (75,000 vehicles a day use SR 520 and create quite a mess) and the shared use path three times a year: spring, summer and fall. Tree roots continue to be a challenge for the path east of the floating bridge. Living in the northwest, we are constantly trying to balance the benefits of trees and our desire to be near them. Because the path is adjacent to trees, it’s often a victim of roots that want to force their way through the path, creating an uneven surfaces. We do our best to stay on top of them – often repairing parts of the path punctured by them. 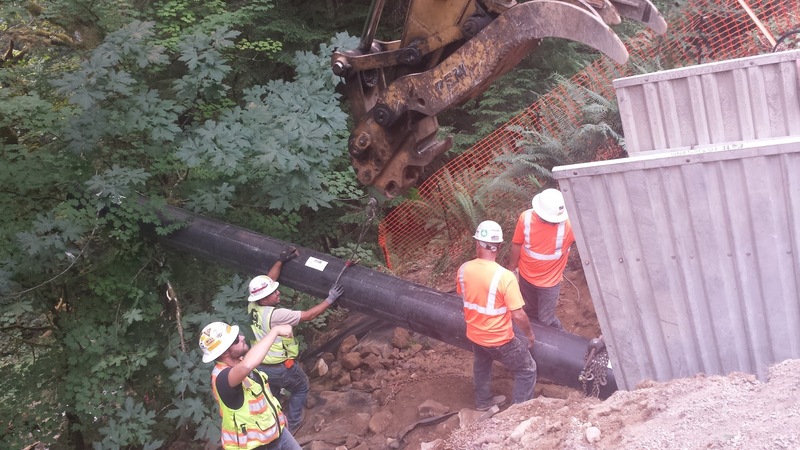 This year our crews spent four days repairing a section between West Lake Sammamish in Redmond and 148th at Overlake. There are still more sections that need to be torn up and repaved so we’ll continue to do that work as time and funding permits. If you see problems with the path, please let us know. We’ll pinpoint the problem and do our best to address it. Your best bet to let us know is to snap a picture and e-mail it to NWpublicaffairs@wsdot.wa.gov. We’re excited we are continuing to add trails that connect communities. Happy trails to you! 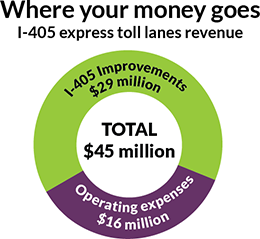 New financial numbers for the I-405 express toll lanes show that they have raised $44.5 million dollars in their first two years. As directed by the Legislature, money raised on I-405 is used for only two purposes: to cover operating expenses and, most importantly, to invest in improvements to I-405. Of the total, $28.8 million is being used to relieve congestion and improve travel for the people who use I-405 each day. Let’s take a look at how that money is being spent and what investments we’re planning for the future. And if you’re interested, you can see the full financial reports here. When you pay a toll, you’re probably thinking about how much time you’ll save, not how much money tolls are raising for future highway improvements. Two-thirds of the money from every toll is going to help improve performance on I-405. In April, we invested $11.5 million to build the new peak-use shoulder lane from Canyon Park to Lynnwood. 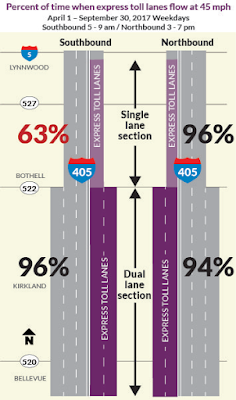 Toll revenue also paid for other improvements, such as a new merge lane in Bothell, which gave drivers space to merge in and out of the express toll lanes without slowing traffic behind them. Together, these recent improvements have had a positive effect on the northbound afternoon commute. Traffic is flowing more smoothly across all lanes and toll rates went down. Now more people can get home faster whether or not they choose to pay a toll. What comes next for I-405? The remaining money is being kept in a dedicated fund specifically for more I-405 improvements, and the Legislature has asked us to study two future projects. At the Legislature’s direction, we’ve begun working on some early design concepts to reduce congestion between Bothell and Lynnwood by rebuilding the SR 522 interchange. We are also analyzing construction of a new express toll lane in each direction up to SR 527. Ultimately, the Legislature will decide whether toll money should be used to build this project. Our customer service centers, phone line, and online support are based in Puget Sound and help an average of 15,000 people a day. This work is done by Electronic Transaction Consultants, a private vendor based in Texas which employs 120 people in Puget Sound for Good To Go! This is the cost to operate and maintain the toll equipment. That includes dozens of high-speed infrared spectrum cameras, laser scanners, and radio frequency identification antennas to recognize vehicles. This work was done by Kapsch, an intelligent transportation system design firm which specializes in tolling. About 50 people work in our offices around King County to oversee statewide tolling operations. We manage toll finances, calibrate the traffic management computer system, plan system improvements, communicate with the public, and manage the customer service and toll equipment vendors. This cost is shared between all toll roads, including I-405. About four percent helped pay for Washington State Patrol’s troopers enforcement of the rules of the express toll lanes. Three percent went to the Office of Administrative Hearings which hears disputes from drivers contesting unpaid tolls. These costs are only associated with certain transactions, like buying a new pass or a Pay By Mail fee paid by drivers without a Good to Go! account. A lot has changed in the Puget Sound region since the I-405 express toll lanes opened in 2015. With a new driver moving to the area every six minutes, the population boom poses a huge challenge to all of our roads. Before the express toll lanes opened, there was no way out of traffic on I-405 but now people have a choice for a faster trip when they need it. While I-405 still experiences daily congestion, the express toll lanes are providing a more dependable option than the old HOV lanes could and even people in the regular lanes are moving faster in most areas than they were two years ago, despite there being more vehicles on the road than ever before. The population boom means more vehicles are using every major Puget Sound highway, and none has seen as rapid a growth as I-405 between Bellevue and Bothell. Traffic volumes in this area have increased twice as fast as on I-5 through Seattle, and this section of I-405 is carrying 10 percent more vehicles a day than it did two years ago. But even with more people, this portion of I-405 is now moving as fast or faster across all lanes than it was two years ago. How's this possible? We've made dozens of improvements to I-405 since 2015, and we're getting extra mileage out of them because express toll lanes are more efficient than regular lanes when traffic is at its worst. At the height of the peak commute, each express toll lane is carrying 20-30 percent more vehicles than a regular lane in some places, which helps the entire highway flow more smoothly. And when drivers choose to leave the regular lanes to use the express toll lanes instead, they free up space for the other drivers around them. That all means that we're getting a lot more benefit from the new lanes we built in 2015 than if that space had been used for regular lanes instead. 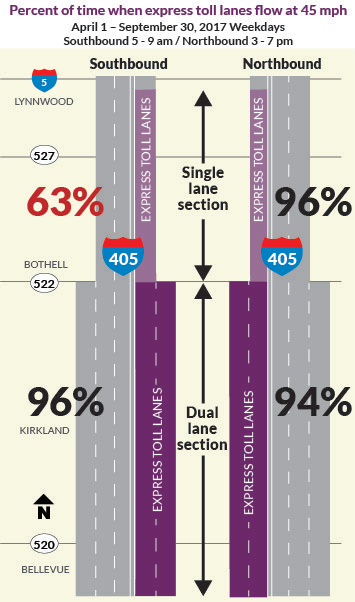 For most parts of I-405, there is no question that the express toll lanes are working a lot better than the old HOV lanes which came before them. Every day, more than 60,000 drivers choose to use the express toll lanes for a faster trip. About two-thirds of those people are choosing to pay a toll, and a third are riding in the lanes for free in a carpool, motorcycle, or bus. Support for express toll lanes has also increased. When we surveyed I-405 drivers this summer, about two-thirds of people agreed that they liked the option to use the express toll lanes and believed they reduce congestion for some trips in the regular lanes. During peak commute times, the average toll is about $3, which typically saves drivers 10-15 minutes (or more when tolls are higher). On average, the express toll lanes move 19 mph faster than the regular lanes going southbound in the mornings, and 23 mph faster than the regular lanes heading northbound in the evenings. One way that we measure success is to look at the percentage of time during peak periods when the express toll lanes are able to move at 45 mph or faster. That's roughly the speed when the system is flowing most smoothly and carrying the greatest number of vehicles at a time. When the express toll lanes opened, the state legislature set a goal that they would move at this speed 90 percent of the time. By that measurement, the express toll lanes are flowing at least 45 mph about 95 percent of the time in most places. That's a success in most locations, however the area between Bothell and Lynnwood is a bit more complicated. This section of highway has fewer lanes, and when the express toll lanes first opened, they struggled to keep up with population growth in this area. Today, drivers are experiencing a much smoother commute northbound heading home in the afternoons since we made several changes to give drivers more space to merge, improve access points, and build a new peak-use shoulder lane. But the southbound morning commute from Lynnwood to Bothell is still a big challenge. This area only moves at 45 mph about 63 percent of the time. Moreover, this challenging section brings the overall average for the entire system down to 85 percent, just short of the 90 percent goal. The old HOV lanes only met this standard 56 percent of the time in 2015, so this is a still an improvement compared to two years ago despite all the new cars on the road. What does this mean for future travel on I-405? When the express toll lanes were authorized, the Legislature provided two metrics by which to measure the lanes' success during the first two years of operation: that the lanes pay for themselves, and that traffic moves at 45 mph 90 percent of the time during peak travel times. The lanes are meeting the first measure easily, and are coming close to the second. Now that the lanes have been operating for two full years, we're working with legislators to determine the next steps for the express toll lanes. After years of work planning and constructing almost $800 million in passenger train improvements, we're excited to be just days away from saying “All Aboard!” to our new, expanded Amtrak Cascades service. Starting Monday, Dec. 18, we'll have additional trains running each day and travelers will use our new Amtrak Cascades Tacoma Dome Station in Freighthouse Square for the first time. If you can't wait to see the station, you can watch a video of the station construction online. Our work didn't just take place in Tacoma, though: it involved 20 projects that stretched from Blaine at the northern border of the state all the way down to the Port of Vancouver on the southern border. Tracks and signals were upgraded, stations improved or built, eight new Siemens Charger locomotives purchased and landslide catchment walls added to keep debris from reaching tracks and stopping train service. the design of the station featuring large windows, wooden beams and terrazzo flooring. The improvements are all geared toward making passenger train travel in Washington more convenient and attractive, including allowing us to add two more daily round trips between Seattle and Portland. This makes it easier to plan day trips on Amtrak Cascades -- whether for business or fun. The improvements also cut travel time between Seattle and Portland and help improve on-time reliability. We, along with the Oregon Department of Transportation, fund and oversee the Amtrak Cascades service, contracting with Amtrak to run the trains on a day-to-day basis. You can learn more about the new times and schedules online, as well book your next trip. You can also book by phone at 1-800-USA-RAIL. This map of the Point Defiance Bypass -- in orange -- shows the route passenger trains will take in and out of Tacoma starting Dec. 18, including areas that will parallel I-5. It's one of many improvements along the Amtrak Cascades corridor in Washington. Part of the new service is made possible by trains taking a new route in and out of Tacoma – one that eliminates sharp corners and a single-track tunnel along Point Defiance. The new Point Defiance Bypass route starts in Nisqually and continues into South Tacoma, paralleling Interstate 5 in several areas near DuPont, Lakewood, Joint Base Lewis-McChord and Tacoma. Drivers will see the trains along the west side of I-5, so be prepared for the changing views and any other drivers who may be distracted by the passing trains. If you use intersections near I-5 like the Thorne Lane, Berkeley, 41st Division/JBLM Main Gate or Steilacoom-DuPont Road, you'll also want to be alert for signals and crossing arms when trains come through, and you may want to leave a little extra travel time while everyone adjusts to the change. New Charger locomotives, like this one seen at Seattle's King Street Station, will power the enhanced Amtrak Cascades service. They will run the entire Amtrak Cascades corridor, from Vancouver, British Columbia to Eugene, Oregon. Do not walk on or near tracks. Do not stop your vehicle on railroad tracks while waiting for traffic. Obey all signals at all times – for both pedestrians and drivers. Wait for crossing arms to go up and/or lights to stop flashing before entering a crossing; trains travel in both directions on the tracks and one may be coming from the opposite direction of another that just passed by. Need more tips for staying safe near tracks? Doug Baldwin of the Seattle Seahawks has you covered – take a look at the train safety video he partnered with us to create as well as a train safety adventure video. Our Stay Back from the Tracks webpage has even more safety information. Please follow these tips to keep yourself and everyone else safe near train tracks. And starting on Dec. 18, enjoy our expanded service and new station! Jason Rossi and Wayne Reed say it was no big deal. Just what they train for and part of their job. OK, that may be true. But, still, it is a big deal. On Oct. 20, Rossi, Reed and the rest of the crew of the ferry Spokane had just arrived at the Edmonds terminal when the emergency alarm sounded. The alarm alerts crew that a rescue is needed. And indeed, a kayaker had overturned and was in trouble. The crew sprang into action and Rossi and Reed took their places in the rescue boat. Other crew members helped get the boat lowered into the water. Rossi and Reed then motored to the kayaker, getting him into the rescue boat and taking him to waiting aid crews on shore. 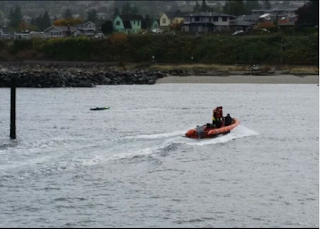 The kayaker was treated for hypothermia but was otherwise OK. The entire rescue took about seven minutes. For their efforts, Reed and Rossi were awarded a Life Ring Award during a ceremony aboard the Spokane on Dec. 7. "It’s what we train for," Rossi said. "We had great teamwork. You’re always glad when you can help someone in need." 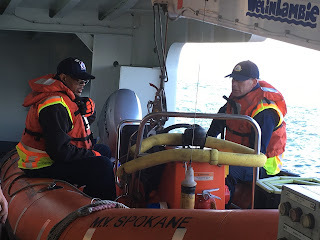 Wayne Reed (left) and Jason Rossi prepare for a water rescue training drill aboard the ferry Spokane. "We were just doing our job," Reed added. "The rescue we did, it was like second nature because we train for it all the time." Every ferry crew in our fleet trains every week for a variety of emergency scenarios, including water rescues, fires and medical emergencies. New employees go through a variety of training before they ever begin a shift, everything from first aid to firefighting certification. This year, our ferry crews have responded to 81 rescue/medical emergencies. "Safety is job No. 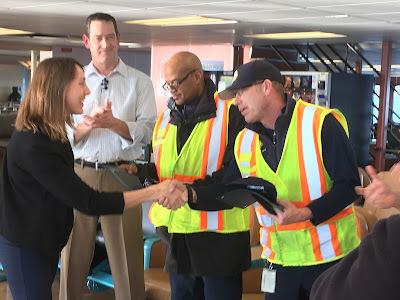 1 for us, both for the public and our crews," Assistant Secretary for Ferries Amy Scarton said. "(Secretary of Transportation) Roger Millar and I both went through the training so we saw first hand what our workers go through." Our ferries crew do a great job of getting the 25 million people who ride every year to their destinations safely, and we’re especially proud of them when they step up and put their safety training into action by helping someone in need. Great job Jason, Wayne and the rest of the Spokane crew! We’ve completed another year of busy maintenance and construction work. It’s a challenge to schedule all of these projects and also keep traffic moving as well as possible, and we want to once again thank all travelers for their patience and understanding while the work was done. We need to do much of our work in the summer when our weather is most predictable. Unfortunately that is also a busy travel time and roadwork delays or detours can be frustrating. We do our best to schedule around peak travel times and events, but with so much to do during the dry season, it’s often hard to avoid at least some delays. Near Marysville, we paved seven miles of northbound I-5 and a couple of miles of southbound to improve roadway quality and preserve the highway. Work continues in the southbound lanes in 2018. Our #ReviveI5 pavement rehab project repaved 20 lane miles (five miles of four-lane highway) and replaced 400 concrete panels as well as expansion joints on overpasses and bridges near Tukwila to improve and preserve roadway surface. Work continues next summer. Opened three new bridges on northbound I-5, including the new Puyallup River Bridge, and spans over the eastbound SR 16 ramp, I-705 and SR 7. Began construction of the I-5/SR 16 Realignment and Connections project, with work now one-third complete. Realigned and rebuilt ramps to and from SR 7, I-705 and 26th Street. Reopened the A Street ramp to I-705. Opened a new ramp to SR 167 in April. Activated four new ramp meters on southbound I-5 in Tacoma and Fife. The newly constructed northbound I-5 Puyallup River Bridge opened this summer, one of three completed as part of the Tacoma/Pierce County HOV project. The SR 167 bridge is in the background. Near Joint Base Lewis-McChord we extended an auxiliary lane on I-5 between Mounts Road and Center Drive near DuPont, which opened to traffic just before Thanksgiving. In Olympia, crews removed and replaced the Pacific Avenue bridge approach slabs and expansion joints. 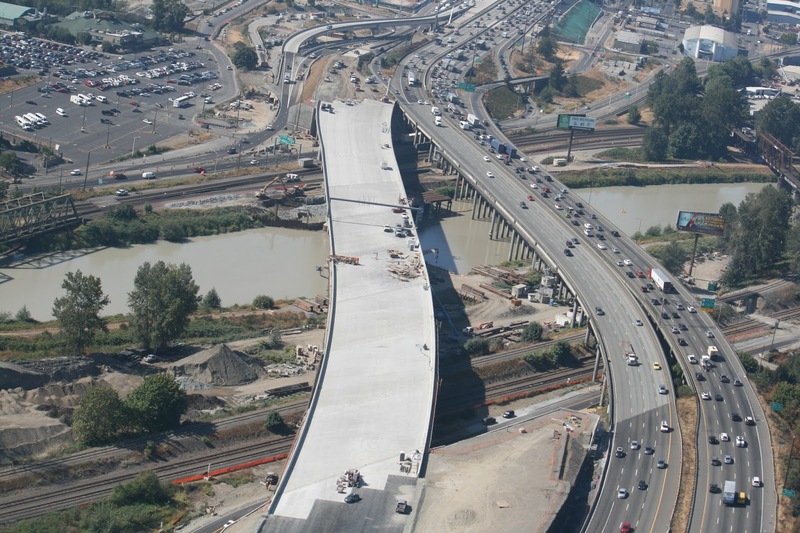 In Chehalis, work to replace the damaged Chamber Way overpass above I-5 began, with construction of a bypass bridge next to the existing structure. The new wider and taller overpass is scheduled to be complete next fall. The bridge was damaged by a semi truck hauling excavators in 2016. Crews replaced expansion joints, installed new waterproof membrane, applied new lane striping and resurfaced bridge decks on the southbound lanes of the North Fork Lewis River Bridge near Woodland and the I-5 railroad bridge south of Kalama. In Spokane, crews replaced expansion joints and concrete approach slabs on I-90. As part of the project to improve a 15-mile section of Interstate 90 from Hyak to Easton over Snoqualmie Pass, crews finished the second of two avalanche bridges in early November, allowing both directions of traffic on the bridges this winter. These elevated bridges should reduce the number of times the road is closed for avalanche prevention work this winter. The second of two arches of the wildlife overcrossing across I-90 near Price Creek also was completed. Near Cle Elum, we replaced 3 miles of 45-year-old concrete in the westbound I-90 lanes. Crews removed approximately 15,000 square feet of material as part of the project to repair three bridge decks in the westbound lanes between the summit of Snoqualmie Pass and North Bend. This project also included replacing deteriorating concrete panels in the eastbound lanes between North Bend and the summit. Crews milled and smoothed more than 87,000 square feet of concrete. 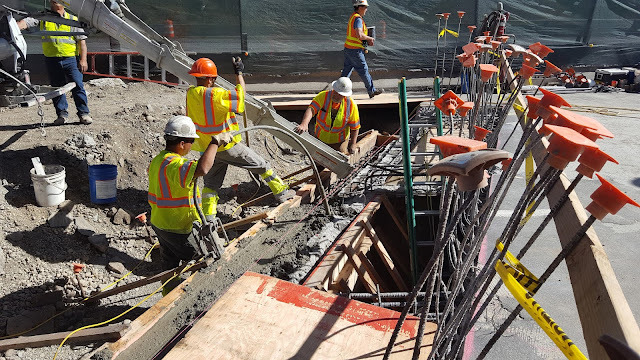 In Spokane, we replaced bridge expansion joints at the Third Avenue Bridge near Liberty Park and the downtown viaduct near Division Street. We also repaired the Third Avenue Bridge deck and approaches. Crews also resurfaced pavement from the Adams County line to the Spokane County line. bridge decks between North Bend and the summit of Snoqualmie Pass this summer. Crews began building a temporary home for the King County Water Taxi and Kitsap Transit Fast Ferry as part of the overall Coleman Dock Project on the Seattle Waterfront. 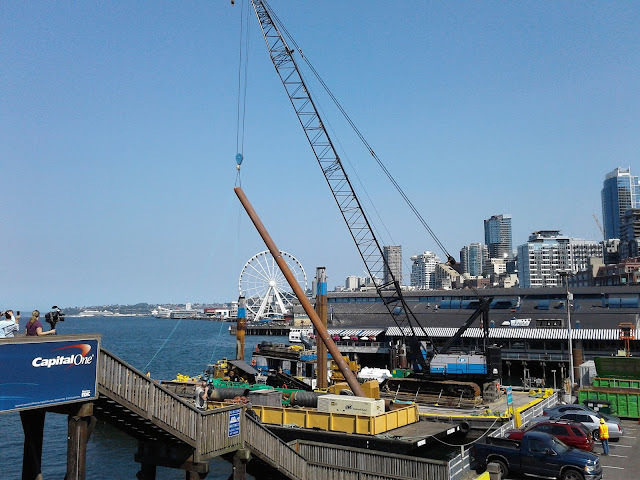 This work was needed to demolish and rebuild the passenger-only ferry terminal on the south side of the dock. Construction of our fourth Olympic Class ferry, Suquamish, is now about 75 percent complete and passed a significant milestone this fall when it left drydock for the first time. We’ll take delivery of the ferry in July 2018; it’s scheduled to enter service next October. 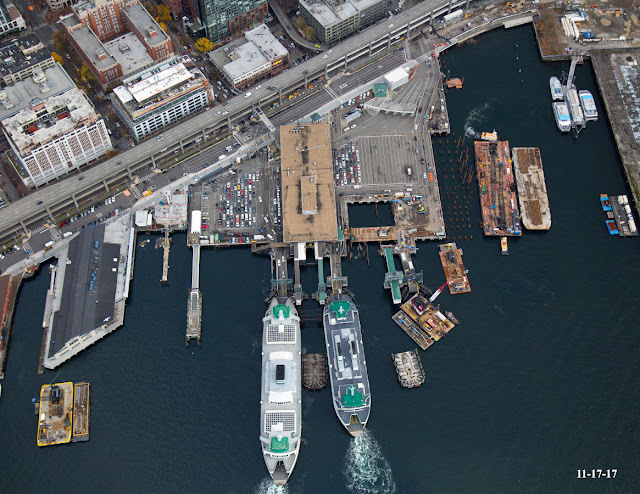 In June, construction began on the first phase of the Seattle Multimodal Terminal at Colman Dock Project to rebuild our aging and seismically vulnerable flagship ferry terminal. Crews began work to replace the 79-year-old wooden dock with a sturdier and safer steel and concrete trestle. The project will be complete in 2023. We also started to prepare the site of the new Mukilteo ferry terminal in September, with crews removing decades-old concrete walls and installing in-water piles for the new trestle. In early 2018, crews will begin installing stormwater utility lines. The new terminal is scheduled to open in 2019. Tunneling machine Bertha broke through into the receiving pit in April 2017, a major milestone in the Alaskan Way Viaduct Replacement project. With Bertha’s work completed, Seattle Tunnel Partners spent the summer dismantling the machine piece-by-piece and hauling away more than 16 million pounds of machinery from the disassembly pit at the tunnel’s north portal. STP also continued building the interior structures inside the tunnel. Work wrapped up on the nearly $800 million federally funded improvement program for our Amtrak Cascades passenger rail service this fall. The multi-year program stretched from Blaine to the Washington/Oregon border and included track and signal upgrades, station improvements, a new route in and out of Tacoma – including a new station -- and new locomotives. The result is two more daily roundtrips between Seattle and Portland starting Dec. 18, as well as shorter travel time between the cites and improved on-time performance. 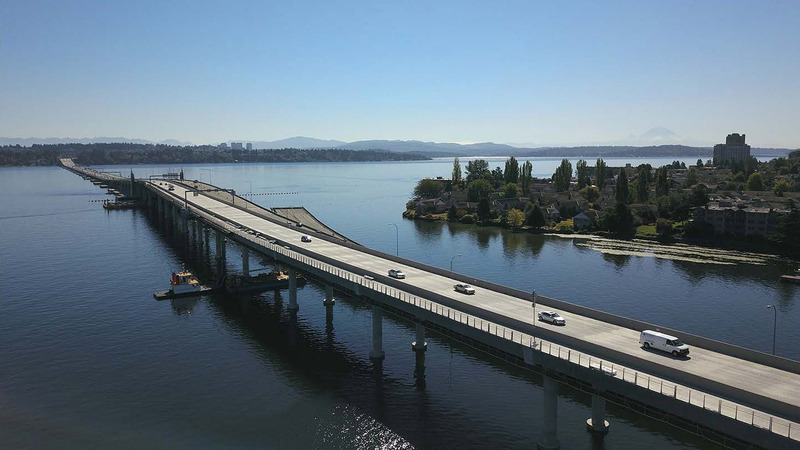 After nearly 3 years of construction, the SR 520 Program delivered a new westbound bridge over Union Bay that links the new floating bridge to Seattle’s Montlake neighborhood. In July, we opened a new exit lane and new off-ramps to Lake Washington Boulevard and Montlake Boulevard. In August, the bridge’s mainline opened, which includes two general-purpose lanes, a transit/HOV lane and a full shoulder for disabled vehicles. 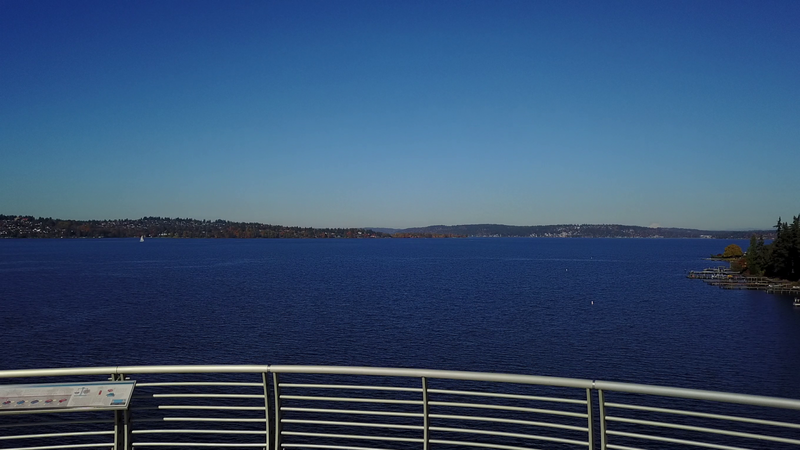 On Dec. 20, we’ll open the bridge’s bicycle and pedestrian path, extending the new SR 520 regional shared-use path across Lake Washington from the Eastside to Seattle. In addition to planned construction and maintenance, crews also responded to emergencies such as landslides or road washouts, working on both temporary and permanent repairs. A failed culvert and catastrophic washout on US 395 in Stevens County led to emergency repairs on a 500- by 100-foot deep section of destroyed roadway. The failed culvert also was replaced with a larger, fish-friendly structure. A temporary Bailey bridge was placed over the flood-damaged SR 21 North Fork Sanpoil River Bridge in Eastern Washington. Crews in Seattle and Issaquah responded to landslides near Spokane Street east of I-5 and a debris flow onto I-90. They also responded to a potential slide area on SR 530 near Montague Creek that required a closure until geotechs determined it was safe to reopen. Both SR 11 and SR 410 also had rockfalls that required work to clean up and remove loose rock. Near Newport, a corroded arch support on the SR 25 Columbia River Bridge required emergency repairs and road restrictions for several months. Emergency repairs were also needed on SR 20 Loup Loup Pass after a series of slides, washouts and flooding damaged several sections of roadway. Many hillsides in the area were scarred from previous years’ fires, exacerbating the damage caused by heavy rain. Besides large projects, we also complete on-going pavement replacement and preservation work each summer, improving road surfaces and extending the life of our roadways. I-5 bridge resurfacing work near Woodland and Kalama was one of the many pavement and bridge improvement projects our crews completed this summer. We paved, replaced expansion joints and improved road surfaces across the northwest corner of our state, including work in or near Whidbey Island, Sedro-Woolley, Marysville, Renton, Enumclaw and Everett to name just a few. In total for the six-county – Whatcom, Skagit, Snohomish, King, San Juan and Island – area we paved 247 miles of roadway (including areas where several lanes of one stretch were paved). Further south we repaved 62 miles worth of pavement in Grays Harbor, Kitsap, Pierce and Thurston counties and chip sealed another 146 miles worth of roadway in Clallam, Grays Harbor and Mason counties. In the southwest section of our state we repaved, chip sealed or replaced concrete panels on 495 miles of roadway, as well as other related improvements. This included work on SR 7 between Morton and Elbe and paving work on Padden Parkway (SR 500) in Vancouver. Crews replaced four culverts under SR 7 near Morton using a “pipe bursting” technique that avoided excavation by breaking and relining, which saved time and money and was better for long-term maintenance. In south central Washington crews also paved approximately 187 lane miles and chip-sealed 214 lane miles in Kittitas, Yakima, Benton, Franklin, Walla Walla, Clarkston and Asotin counties. Crews also chip sealed 210 miles on eight highways in Chelan, Douglas, Grant and Okanogan counties in the north central part of the state. That work also included building a two-mile long passing lane on SR 28 at Spanish Orchards, and strengthened the road bed under the new surface of SR 283. 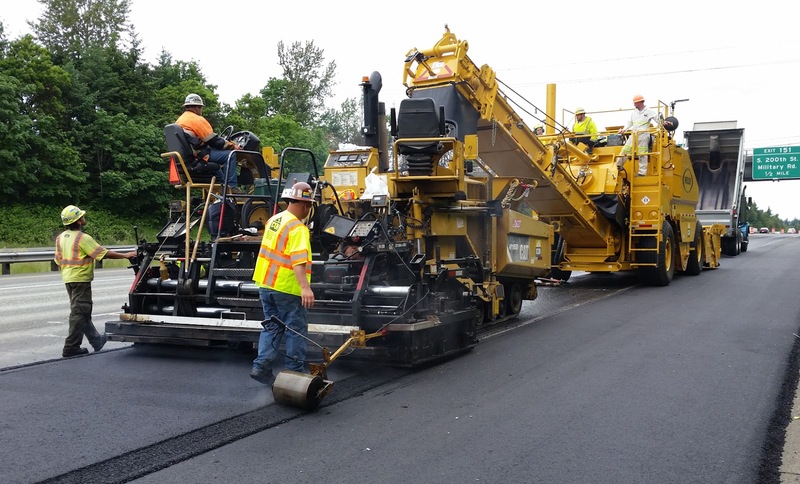 On the eastern side of the state we repaved or repaired more than 29 miles of roadway on projects including US 2, SR 270, SR 290, US 395 and SR 904. Work also included turn-lane improvements on US 2 from SR 206 to Day-Mt. Spokane Road. Crews pave a section of I-5 as part of the #ReviveI5 pavement rehab project between Kent and Tukwila this summer. SR 532 at Church Creek near Stanwood. SR 900 at Green Creek near Renton. In Spokane, work began constructing two US 395 freeway bridges over Freya Street north of Francis Avenue, part of a multi-year improvement project for the North Spokane Corridor in that area. Work will continue into 2019. From Randall to White Pass we resurfaced 24 miles to extend the life of the highway. A portion completed the chip seal project begun last year, while an area between Packwood and White Pass was repaved a season sooner than planned due to extensive winter pavement damage. Between Packwood and Rimrock we repaired culverts and drainage, repaved 14 miles and removed 1,400 tons of loose rock and material above US 12 near the Rimrock Tunnel. Eight miles of roadway were repaved starting just west of Fern Bluff Road in Sultan and ending near Tenth Street in Gold Bar. 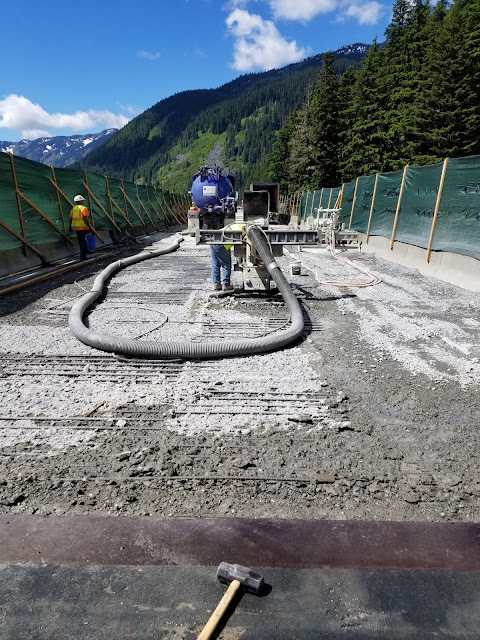 Three segments of roadway – nearly 17 miles total – were resurfaced between Gold Bar and Skykomish. On US 195 from Colfax to Spangle we added a passing lane in each direction near Steptoe. We added roundabouts at the SR 150 and No See-Um Road intersection near Chelan as well as the SR 28 and Fifth Street intersection in East Wenatchee to improve traffic flow and reduce collisions. Crews on the SR 104 Hood Canal Bridge adjusted and aligned guide rollers used to operate the drawspan for marine traffic. Workers also will replace worn gearboxes and hydraulic hoses as part of this important preservation work. The two Sol Doc River Bridges north of Forks on US 101 were cleaned and got fresh coats of evergreen paint, protecting the bridges from the elements. We constructed a stabilizing rock buttress wall and resurfaced two damaged sections of roadway located at the far west end of SR 112 near Sekiu. The majority of our work is done for the year, but we’re already planning for next year’s construction and preservation work. We’ll once again be out and about preserving or improving many areas and we ask you to remember to slow down and stay alert anytime you’re in a work zone. We want to keep you and our workers safe – and to focus on the work that makes traveling safer and more efficient for everyone. Although we haven't done this since Hammer pants were hip and Amazon only sold books, starting January 7, 2018, the sailing schedule on our Seattle/Bainbridge and Seattle/Bremerton routes will change. Due to construction on Colman Dock, several sailings to and from of our flagship ferry terminal in Seattle will depart 5-15 minutes earlier or later than they currently do. firmly in the ground, we're making good headway building your new Colman Dock. Soon after the New Year, construction to make Colman Dock safer in a major earthquake will shift from pile driving work to demolishing a portion of the Seattle terminal building. The terminal will remain open during the work, with no cuts to service, but the building will be much smaller and will not have enough space to accommodate passengers leaving for more than one destination at a time. The new sailing schedule in and out of Colman Dock staggers trips so that only one ferry arrives and departs at a time. This way, there's plenty of room to hold a boat's worth of travelers inside the smaller terminal building. Learn more online, or join us at one of our sailing schedule drop-in events this month. Before you make merry, check the time of your ferry. Some ferry routes operate on a holiday schedule on Christmas (Dec. 25) and New Year's Day (Jan. 1). Since New Year's Eve falls on a Sunday this year, your sailing may also be on a Sunday or weekend timetable as well. Last, but not least: It's not just the Seattle routes that change on Jan. 7. 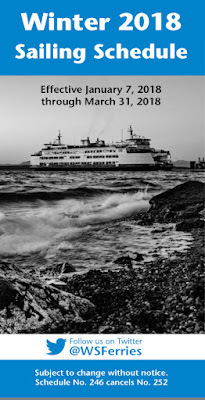 As tourist season goes into brief hibernation for the winter, there will be fewer sailings on our Anacortes/San Juan Islands route and ferry service to Sidney, BC will be suspended until spring. In less than three weeks, the SR 520 Trail for bikes and pedestrians will extend across Lake Washington! Crews are completing the final touches on the path’s newest section over Union Bay in Seattle and at 3 p.m., Wednesday, Dec. 20, the trail will open to the public. So grab your walking shoes and bike helmets (and maybe rain jackets too) and get ready to enjoy the new connection between the Eastside and Seattle. A trail across Lake Washington has long been contemplated on SR 520. When discussions about reconstructing SR 520 began in the late 1990s, the idea to include a bicycle/pedestrian path quickly gained traction. Feedback from the community during the planning stages made clear a bike and pedestrian facility should be an important part of the project. The trail is designed for users of all abilities, from the casual or serious rider, to pedal-powered commuters, to walkers out to savor the sunset or gaze at Mount Baker and Mount Rainier. 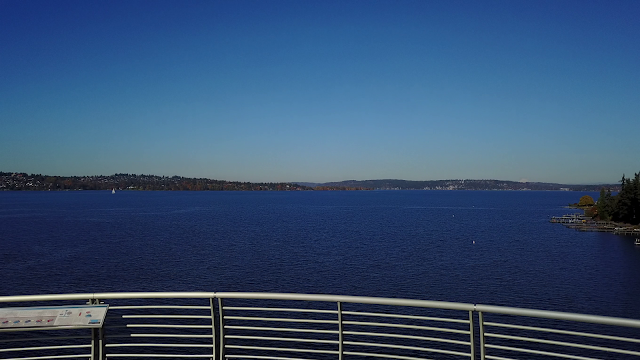 Along the 2.7-mile trail above the lake, you’ll find 11 viewpoints, perfect places to take a break and enjoy the scenery surrounding Lake Washington. The trail is 14 feet wide, which allows for a comfortable mix of bicyclists and pedestrians. A concrete barrier provides safe separation between trail users and the bridge’s vehicle traffic. We’ve heard from a few bike riders that the cover plates on the new floating bridge’s expansion joints cause a “bump” when crossed. These half-inch-thick plates are needed to support the weight of fire trucks and aid vehicles in case of emergencies. The plates also must support the load of our large, specialized trucks that use the path for under-bridge inspections. WSDOT’s specialized sweeper, Broom Hilda, will be utilized to keep the trail clean. Please use caution when riding over the cover plates. We’re placing yellow paint at each expansion joint to alert path users of the plates. And for everyone’s safety, keep your speed under 15 mph. With the trail opening in just a few weeks, it’s time to start planning your routes! To help your planning, we put together a few maps of suggested routes. All along each route, you’ll find beautiful views, open green spaces, lively neighborhoods and fantastic regional trail connections. Maybe you’ll enjoy both of the floating bridge paths along SR 520 and I-90, and ride approximately 20 miles to finally complete the box! Heads up – these routes are for inspirational purposes only and may not follow well-established routes. Follow at your own risk (and compass)! No matter which way you go, we hope you enjoy this new community asset. This trail has been a long time in the making and we can’t wait to see you out crossing the lake!